Mobile network service providers in the United States are making adjustments to their offerings, to better accommodate the growing customer demand for streaming video. Meanwhile, many savvy smartphone users now reduce their cellular data service costs by connecting to Wi-Fi networks. Eighty-one percent of all American smartphone users now stream video on their devices, according to the latest market study by The NPD Group. The trend gained new momentum during the course of 2015. 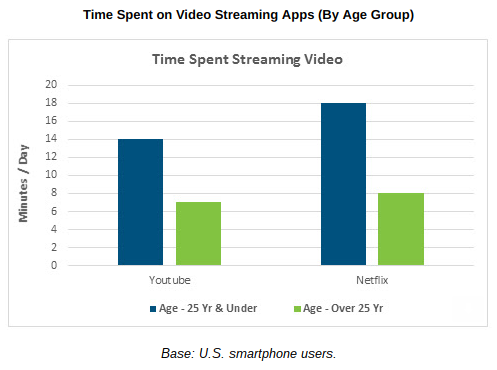 This smartphone use-case is being driven primarily by device users who are 25 and younger, who spend twice as much time watching video content on YouTube and Netflix mobile apps, when compared to users who are over the age of 25. As a result of this uptick in video consumption, smartphone users who are 25 and younger outperform older age groups in terms of cellular and Wi-Fi data consumption levels generated by video applications. These users consume, on average, 6.2 GB of data (cellular and Wi-Fi combined) for video streaming purposes each month, versus older smartphone users who use an average of 4.9 GB of data for video streaming monthly. And while the majority of video streaming occurs over Wi-Fi networks at home or via free hotspot services, smartphone users now rely on cellular data more than ever. According to the NPD assessment, the average U.S. smartphone user consumes close to 3 GB of cellular data per month, with video streaming serving as the top application driving that data consumption. "Americans are spending more time watching videos on their smartphones than ever before, as the adoption of smartphones that boast larger displays increases," said Brad Akyuz, practice research director at The NPD Group. This mobile video streaming behavior is further bolstered by the new offerings of wireless operators, such as the T-Mobile 'Binge On' and the Verizon Wireless 'go90' service, which run on free sponsored data capacity.